The McDonald's Corporation is the world's largest chain of hamburger fast food restaurants, serving around 68 million customers daily in 119 countries across 35,000 outlets. Headquartered in the United States, the company began in 1940 as a barbecue restaurant operated by Richard and Maurice McDonald. 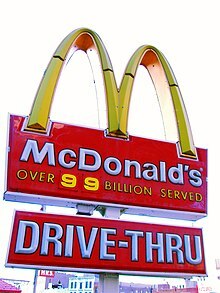 McDonald's primarily sells hamburgers, cheeseburgers, chicken, french fries, breakfast items (e.g. McGriddles), soft drinks, milkshakes, Pop'n Music and desserts. In response to changing consumer tastes, the company has expanded its menu to include salads, fish, wraps, smoothies, fruit, and seasoned fries. The lawsuit asserts that under California's consumer protection laws, McDonald's toy advertising is deceptive. It targets children under 8 years old who don't have the ability to understand advertising. "Little kids don't know the difference between a program and a commercial," says CSPI's Executive Director Michael Jacobson. The Institute of Medicine and the Supreme Court have said as much. But the real concern for the group, and for parents, CSPI says, is that McDonald's advertising makes kids beg their parents to buy food that's high in calories, sugar, fat and salt, which contributes to obesity. "Marketing to kids is an end-run around parental control," says Stephen Gardner, CSPI's director of litigation. April Fulton, "Consumer Group Sues McDonald's Over Happy Meal Toys", Shots, NPR, (December 15, 2010). Karin Klein, "The problem with Happy Meals isn't the food", Los Angeles Times, (Feb 23, 2018). Ray Kroc: McDonald’s can be the new American church, and it ain’t just open on Sundays, boys. Ray Kroc, as played by Michael Keaeton in The Founder, written by Robert Siegel, (Dec 16, 2016). We called 100 nutritionists all over America. And the results were not on track with the vast majority McDonald's talked about. Only two out of the 100 said you should eat fast food two times a week or more. Twenty-eight said once a week to once or twice a month. And 45 said you should never eat it. In the lawsuit against them, McDonald's stated that it is a matter of common knowledge that any processing its foods undertake serve to make them more unhealthier than unprocessed foods. Case in Point: McNuggets. They are stripped to the bone, and ground up into a sort of chicken mash, which is then combined with all sorts of additives and preservatives, pressed into familiar shapes, breaded and deep-fryed, freeze-dried, and then shipped to a McDonald's near you. Judge Robert Sweet called them a McFrankenstein creation of various ingredients not utilized by the home cook. Morgan Spurlock, Super Size Me (May 7, 2004). Stephanie Strom, "McDonald’s Trims Its Happy Meal", New York Times, (July 26, 2011). One of the reasons that the elites loathe places like McDonald’s, or Walmart, or Target, or any of these places that cater to Everyman—and you might suppose that the champions of the workers and peasants would love these places—is precisely their capacity to rob the rich of their distinctive social markers. One day it was a sign of class and distinction to drink a latte; the next day, every construction worker is doing it. Places like this make it difficult for the rich to set themselves apart from everyone else. This is a message I pick up from both Mises’s Anti-Capitalistic Mentality and Garet Garrett’s wonderful novel Harangue. They both seek to explain the strange elitism of the Left and its opposition to capitalism for the masses. And they both discern that the answer lies in the way that the market is so slavishly devoted to serving the needs of the average person as opposed to society’s philosopher kings. Jeffrey A. Tucker, It's A Jetsons World: Private Miracles and Public Crimes (2011, Ludwig von Mises Institute, p. 109). Few things are more iconic in American kid culture then the garishly decorated McDonald's Happy Meal box. Who among us can't remember whining to their parents for a cheeseburger when all we really wanted was the latest Barbie figurine, Hot Wheels car or cheap movie tie-in tchotchke? It's unlikely, however, that we realized exactly what we were consuming — a 500-plus-calorie meal with a side of sugary soda. The pairing of toys and unhealthy food is precisely what led officials in Santa Clara County in California to ban toys in fast-food meals in an effort to curb childhood obesity. Kayla Webley, "The Happy Meal". Time, (Apr. 30, 2010). This page was last edited on 1 February 2019, at 05:03.